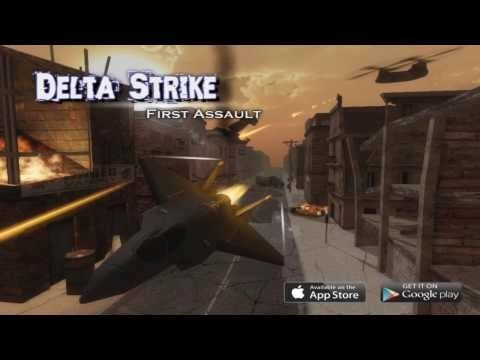 Prepare for action with Delta Strike, an air combat 3D game. The world is at war and as a young pilot now is your chance to prove yourself as a fine military officer and become a Flying Ace. Jump into intense action with your favorite aircrafts like classic airplanes, jets, helicopters and even a drone. Bring air support for grounded troops in combat or engage in fierce combat zones. Blast your way through buildings, missiles, bullets, tanks, helicopters, jets and much more! Seek and destroy your target. Complete your missions and earn experience to learn special maneuvers. Also upgrade your aircrafts with the last cutting edge technology. If you like extreme action, become a member of our squadron right now and feel the excitement of intense combat in the middle of enemy crossfire. At wartime, show the rest of the world how to restore peace with your heavily armed airplanes. - Take control of the skies in over 30 missions. - More than 9 amazing aircrafts to choose from (classics, jets, helicopters or stealthy). - Unlock special skills for advanced maneuvers. - Upgrade and customize your airplanes and helicopters. - Superb 3D quality graphics so you can feel the action. - Intuitive game play and controls (accelerometer or joystick). - Support for must controllers like Xbox, Playstation, etc. If you enjoy shooting or racing games, download Delta Strike Free now! Download the game for free and rate us 5 stars! This will encourage us to keep improving the game continuously.